Across Division 2, last weekend saw a plethora of different results. Multiple match-ups between lower table teams saw clubs put distance between themselves the bottom of the pack. On the other side, NYPD FC's offense continues to produce in the second half of the season and the group now finds itself in a possible playoff spot with a handful of games to go. The two teams at the bottom of Division 2 North may have put on one of the most exciting games the second tier will see this season. A goal in the last few minutes by Sam Allington gave his 10-man Central Park Rangers Reds the win, 5-4, over FC Spring Valley. With about five minutes to go, CPR’s captain Mike Lindley recovered a long clearance by Spring Valley as the team tried to keep the ball out of its end for the last few minutes. After feeding the ball to Allington, the stricker beat both of Valley's speedy center back and the keeper for CPR's first, and final, lead of the night. Spring Valley started the game in total control and didn’t look like it would give CPR any chance on net, let alone five. After 15 minutes their offense controlled the midfield and gave Valley a two goal lead. A 20-yard blast by CPR's Matteo Catania cut the lead to one, but almost immediately FCSV capitalized on poor play by the backline to bring the lead back to two, 3-1. The first half continued on with CPR pushing up, hoping to cut the deficit once again. In the 30th minute, the recently returned Emilo Cordero sent in a long free kick to the top corner of Valley's net to bring the scoreline to 3-2. But once again, the backfield broke down. A Spring Valley defender outpaced and outplayed multiple Red players and got the breakaway chance. CPR’s keeper Antony Simos, only signed last week, missed the one-on-one save. The half ended on more offense as Lindley sent a through ball to fellow striker Federico Testi who netted the third Reds goal of the half right before halftime. While both teams continued to push into the second half the Reds looked more organized, especially in the backline. The midfield passing game picked up and offensive chances began to flow. That was until Cattania picked up a second yellow around the 60 minute mark leaving his team down in both goals and players. Despite this and multiple opposition chances, Testi tied the game in the 75th minute after a scramble in front of the Spring Valley goal. The last 15 were constant end-to-end action. CPR Manager Mike Carducci explained that his team was "admittedly defending out of desperation most of the way." After Lindley’s winning goal, Simos made what Carducci called “the save of the game” by stonewalling a Valley striker on another one-vs-one chance just as the referee was about to blow his whistle to end the game. “For Antony to come up so incredibly huge in his debut with the team after being under such a constant bombardment the entire match really showed his character, and it's something we look to rely on for the remainder of the season,” Carducci said in an email. 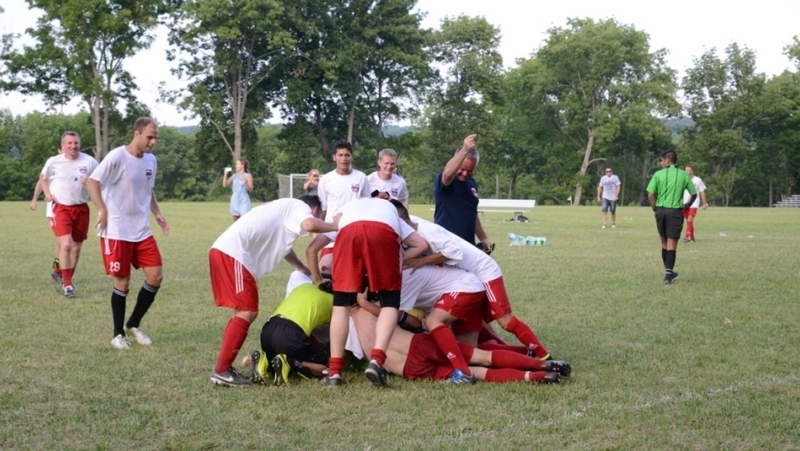 In the battle of D2 South’s best defense against one of its’ strongest offenses, the former prevailed as Polonia Gwardia NY beat Manhattan Kickers, 1-0, in a close match. Marcin Januszko scored the only goal of the game off an assist from Marcin Kulak. His team’s defense was tested throughout the 90 minutes as the Kickers got shots consistently on goal. Polonia keeper David Ditrich made multiple saves for his squad for the clean sheet, the fifth for the team this season and second this spring. The win keeps PGNY three points ahead of Stal Mielec NY with 28. The Kickers now sit at 12 games played with 20 points. Williamsburg International FC is ahead of the group by one point (21) and with a game in hand. FC Ulqini also trails the Kickers by one point (18) with a game in hand as well. On a rainy day in Fishkill, NY, a late penalty call gave Real Ole FC the win, 3-2, over Manhattan Celtic. The result puts both teams at 18 points each but Celtic still edges Real on goal differential (11 to -1), meaning despite the loss Manhattan remains in the top four of D2 North. This isn’t the first time this complaint has been brought up by opposing teams. Back in Week 11, many players for Sporting SC also had issues with Real's field in their draw, 1-1. Marco Charnas and Daniel Arvidsson scored the two goals for Manhattan and had the two goal lead midway through the first half. Though as the game progressed multiple fouls began to catch up with the visiting team. A penalty in the Celtic box awarded Real a penalty to get them back into the game and not long after the game was even at two goals each. With the game looking as though it would end as a draw and give both teams points, a final penalty was called against Manhattan and Real was awarded another penalty kick. Kane described that from his perspective the infraction happened outside the box, but arguments fell on deaf ears as the home team converted the chance for the lead. Despite the loss, Kane says he and his group aren’t letting the loss get to them. “Our job is to move on and we know a win over (CD Iberia) puts us back in the mix,” Kane said. A late goal for Beyond FC was only good enough for one point as the team drew FC Ulqini, 1-1, and failed to gain any ground in the standings. Ulqini now sits in fifth place in D2 South with 19 points, a full three games ahead of seventh place Beyond with 12 points. Erbet Hotaj scored for Ulqini in the first half and was assisted by Gledis Nuza. His team controlled the game tempo for most of the 90 minutes, but Beyond kept attacking late into the second half. A chance finally delivered when Mark Macguinness found Abrahim Hamami for the equalizer. Both teams take on top three opponents when they return to CSL play next weekend as Ulqini takes on Stal Mielec NY on Saturday, April 13, and Beyond faces Williamsburg International FC on Sunday, April 14. NYPD FC increased its’ spring winning streak to three games with its latest win against CD Iberia, 4-1. Jorge Bedoya and Huseyin Kahveci both scored for their team while Demetre Vernon got two goals past the Iberia keeper. Since the second half of the 2018-19 season started the team’s offense has outscored opponents 12 to three and the team now sits in second place with 20 points. The team made up of New York’s Finest, who play during their free time while not on-duty, has become one of the most threatening front lines in D2 North. For CD Iberia the loss keeps the team in the lower half of the table with a chance to be overtaken by Brishna once regular season play resumes next weekend. The second straight loss has seen the squad outscored nine to two through those games. FC Japan’s win over NY Ukrainians, 2-1, means the former jumps up in the table to seventh and puts more distance between itself and the bottom. Japan also increases it’s record to 2-1 for the Spring with both wins coming off close, one-goal leads. Kenji Nakamura and Takenori Nishibayashi scored for FC Japan, including the game winner in the 90th minute off a corner kick. The team will need all the offense it can get in two weeks when it takes on Polonia Gwardia NY on Randall’s Island. For the Ukrainians, the loss is the second in a row following a route against region leading Stal Mielec NY in the team’s first spring game. Adnan "Adi" Zaganjor scored against Japan, assisted by Yousef Alrobay, tying the game at 1-1 before half time. Both teams fought for chances in the midfield but NYU couldn’t close it out for the draw. Sporting SC was able to salvage a point thanks to a second half penalty kick against KidSuper Samba AC leading to a draw, 1-1. Sporting’s club manager Ed Romero explained his the official post game report that the team hesitation on offense is one of the reasons the game ended as it did. The Division 2 North leader Samba struggled on offense during the game. Many of the team’s shots went off-target, blocked by the Sporting defense, or the chance itself was broken up. The only shot the team had on target was also the team’s only goal. Jamar Hooke finished off a cross from Jeffry Garay Rosales in the first half. The second 45 started as a back and forth stuff between the two teams. Sporting’s defense continued to keep KidSuper back while the offenses couldn’t get that final push. Enough chances in the box finally lead to something for Sporting as Kendan Anderson was taken down as he headed toward goal. Abdoulaye "Abbe" Ibrahima took the ensuing penalty kick and scored his 13th goal of the season. Stal Mielec NY kept pace in the D2 South standings after beating Panatha USA, 8-0, and continuing the later’s season long losing streak in 2018-19. Carlos Moreira scored four goals for SMNY in the game and Kevin Romero scored twice. Jacek Lawniczak and Bartlomiej Dziuban rounded out the scoring with one goal each. Pantha struggled to keep up throughout with only nine men available for portions of the match. The win is the largest for the Polish heritage side this season and keeps the gap at over two games between it and any other teams looking to get into the D2 playoffs. The reserve team brought a better result for Panatha as it beat the Stal Reserves, 2-1, as that team remains in the top half of the D2 South reserve division.